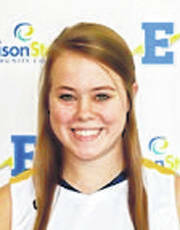 The Edison State men’s and women’s basketball teams swept Cedarville JVs Wednesday. Edison will be back in action Friday at Wright Patterson Air Force Base. 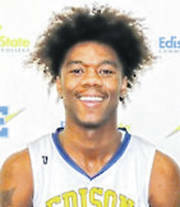 The Edison State men used a big second half to improve to 8-2 on the season with an 87-56 win over Cedarville JVs. After leading just 30-28 at the break, Edison outpointed Cedarville 57-28 in the second half. Lacey Watson hit 11 of 17 shots from the floor, including 10 of 12 from two-point range, in recording a double-double. Watson had 23 points, 10 rebounds and six steals. Lamine Komara scored 13 points, while Dakota Prichard had 11 points, five rebounds and three steals. James Richardson Jr. scored eight points, Roman Morgan pulled down seven rebounds, Sean Jones had three assists and three steals and Cameron Arnold dished out three assists. Edison was 36 of 75 from the floor for 48 percent, including seven of 25 from behind the arc for 28 percent. The Chargers converted eight of 12 free throws for 67 percent. Cedarville was 20 of 48 from the floor for 42 percent, including five of 22 from 3-point range for 23 percent. Cedarville made 11 of 16 free throws for 69 percent. Edison won the battle of the boards 43-27 and had 20 turnovers to Cedarville’s 31. Edison State women led from the start in a 75-47 victory to improve to 7-3 on the season. The Lady Chargers led 17-12, 36-24 and 60-37 at the quarter breaks. Sarah Pothast led the Chargers with 23 points and nine rebounds, while Clair Schmitmeyer filled out the stat sheet with 13 points, 13 rebounds, eight assists and four steals. Kaylesha Broyles had 12 points, three assists and three steals, while Kailani Broyles added nine points and four assists. Sarah Bergman had eight points and seven rebounds. Edison was 32 of 69 from the floor for 46 percent, including missing all four of its 3-point attempts. The Chargers made 11 of 17 free throws for 65 percent. Cedarville was 20 of 61 from the floor for 33 percent, including two of 16 from beyond the arc for 13 percent. Cedarville made five of seven free throws for 71 percent. Edison won the battle of the boards 49-30 and had 17 turnovers to Cedarville’s 27.